Want to learn the art of off-loom beadwork, or master your new beading skills? 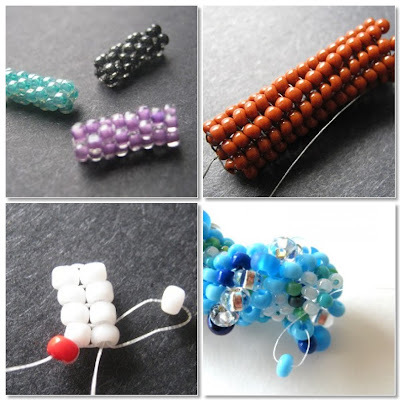 You can find free, basic Beading Tutorials here on Inspirational Beading every month. You can also try the Bead Spotlight segment for some recommended projects using the bead of the month, and Wear It Twice for projects inspired by the necklace of the month. Want to share a tutorial on Inspirational Beading? I welcome guest posts from crafters, designers, and suppliers on how to make beadwork, jewelry, or bead crafts. You can learn more on the Features page. Peyote Stitch Master Class Lesson One: Two Drop Peyote Learn the peyote technique and make a cuff with built-in fringe. Peyote Stitch Master Class Lesson Two: Even-Count Peyote Basics Learn even-count peyote, weaving in thread, and zipping up peyote to make a pretty ring. 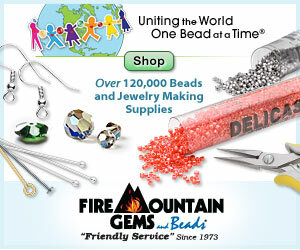 Have a browse at AllFreeJewelryMaking.com From the makers of FaveCrafts.com, this site provides an amazing catalog of free beading and jewelry tutorials. Inspired Beaders Interviews with fantastic bead makers, jewelry designs and artists who use beads. Book Spotlights Must-reads in beading and crafts. Bead Color Trios Exploring the possibilities of inspired bead palettes in three colors. Inspiration Tips Ideas for avoiding beader's block, and ways to stay creative. Favorite Beads Talented beaders share tips on using their favorite materials. Favorite Techniques Learn how other designers found their creative calling. Wear It Twice Take a beautiful necklace, then add basics in a simple color palette to create two unique outfits.